and pulled him toward me. I devoured this book. Legit. Less than a day. I just HAD to know what happened! The story does a great job of keeping the reader interested and on their toes. The path they take to get Jack back is as dangerous as they come so I always felt a little on edge when I was reading, just waiting for bad things to happen. The story does have flashbacks interspersed that take us back to memories of Nikki and Jack and gives us a little better insight into their relationship. I loved this! 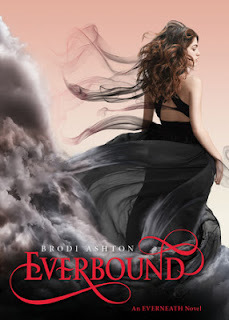 They alluded to it in Everneath but we definitely get more of the picture in Everbound. Jack is adorable. I cannot deny it. Their love story is beautiful and innocent...but I can't help but feel a little bit more drawn to Cole. I don't know what it is! Jack is amazing, I do love him, don't get me wrong, but the fact that Cole is helping Nikki find her love even though he loves her...there's just something so right about that. He knows where her heart is but he cannot give up the hope that she could maybe see him more than an evil mastermind Everling. I also loved the re-appearance of Mrs. Jenkins. I thought here scenes really brought depth and a different look to the story as a whole. We get a different perspective on a story only told from one angle. The Greek mythology references I couldn't get enough of. The parallels between the stories are just so cool! As we know this is a Hades and Persephone re-telling but Ashton alludes to a few other stories that you never really know what ancient Greek myth our characters here will follow and what the outcome will be. I love when a plot twist surprises you! It doesn't happen for me all that often and I love when it does and it fits with the story.